In the summer of 2016 Lyte Burly of NYC and Dink the Professor from the UK joined us in the Swamp for a weekend get together. In addition to all the personal training we did, we also filmed two new DVDs to share the art with you! The first one is on Advanced Footwork, the follow up to the Footwork volume we did earlier in the year. It covers more advanced partner drills to develop the fighting footwork that is so important to 52. Learn to combine your blocks and strikes with your footwork for maximum effect. Coach Dink from the UK helps out Lyte Burly on this presentation and does an excellent job. The DVD also has bonus footage of Lyte and I doing Blocks 11-20 with counter punching on the focus mitts so you can add these techniques into your shoeshine and other drills. Here's a sneak peek at the introduction to the DVD so you can hear about what will be covered as well as have a look at a fun advanced variation of a "simple" partner stepping drill! The second DVD is a very specialized presentation by Coach Dink on the art of concealing razor blades in the mouth and being able to spit them out again. He also shows applications of the blocks you'll be familiar with but now using the blades. This is highly unusual information but we felt it was important to document it for future researchers while we had the opportunity. Because of the nature of the second DVD, to help control who has this information to some degree it will not be for individual sale. Instead, it will be included as a bonus for people who get the complete video collection. 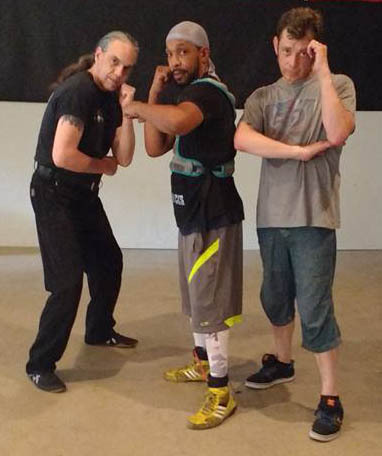 Coach Lyte Burly covers advanced two-man footwork drills with special guest Dink the Professor from the UK. Bonus footage of Blocks 11-20 done with the focus mitts is covered as well! Coach Lyte Burly covers footwork drills that will turbo-charge your feet and put �wheels� under all the blocks and strikes that you've learned so far. You've seen Lyte's footwork in countless YouTube sparring and training clips, now gain these skills for yourself! Get 52 Blocks Basic Training, Footwork, & Advanced Footwork as a set and get a free bonus DVD on the use of the Razor Blade in 52 Blocks. Learn how to conceal not just 1 but 2 razor blades in your mouth and spit them out again as well as how to use them with the art. For academic study ONLY - this is shocking information! But having learned the "trick" you will hopefully be better able to defend against such an attack.